Find out more about Storm Boy, based on Colin Thiele’s beloved book, coming to the Southbank Theatre stage in 2019. Based on Colin Thiele’s beloved book, Storm Boy comes to the Southbank Theatre stage in 2019. Storm Boy is the beguiling story of a ten-year-old boy, living a socially isolated life with his father, on South Australia’s vulnerable coastal wetland – the Coorong. It’s a story about place, at times beautiful and tranquil and also wild and bleak, where the narrow mouth of The Murray River meets the Southern Ocean. In Storm Boy, the Coorong is also a place of refuge for Storm Boy and his father, Hideaway Tom. The familiar historical theme in Australian literature, one that charts the harshness of physical landscape and social isolation on the boundary, permeates Storm boy. The location is both alienating and compelling and as events unfold, we see our interdependence with place and with each other come into sharp focus. The themes of resilience and acceptance are also strong undercurrents in Storm Boy. The historical resilience of First Peoples still negotiating the heavy colonial footprint questions how we navigate our shared future. However, there is a sense of hope amidst enormous loss at the heart Colin Thiele’s story, hence its enduring legacy. Thiele’s novel was first published in 1964 and captured the spirit of an entire state by entering the school curriculum, educating generations of South Australian children on protecting their coastline through its message of conservationism. 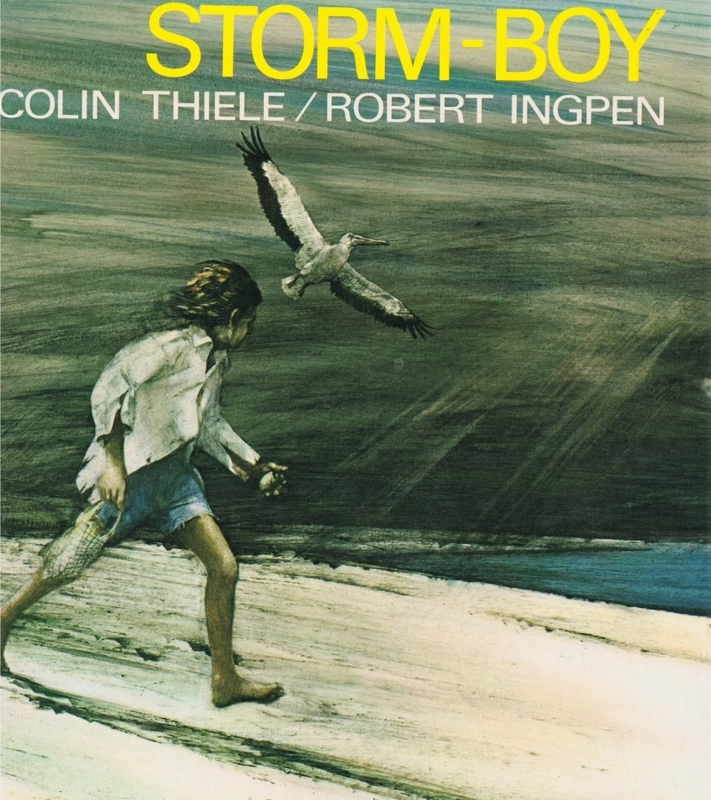 The cover of Colin Thiele’s 1964 novel Storm Boy. In 1976, the Coorong’s distinctive landscape reached the whole country through Geoff Burton’s mesmeric cinematography in the film adaptation Storm Boy. The silver screen cemented the tale of Fingerbone Bill, Storm Boy, and Hideaway Tom into Australian public consciousness and secured its position as a cherished narrative in the canon of Australian stories. It also catapulted the careers of several actors, including David Gulpilil, who went on to star in Rabbit Proof Fence, Crocodile Dundee and Australia. In Storm Boy the film version, we initially see the characters as displaced; outsiders from mainstream society. Single parent Hideaway Tom, is trying his best to provide a home for his son in their makeshift shack on the storm-thrashed beach, while Fingerbone Bill camps illegally and alone on his people’s traditional lands. We feel what it is to live at the mercy of lonliness; in both men we see the deep hurt of dispossession. However, in spite of their loss, broken lives and cultural differences, a friendship develops between Fingerbone Bill and Storm Boy. Fingerbone Bill becomes Storm Boy’s mentor and shares his infinite knowledge of the Coorong. 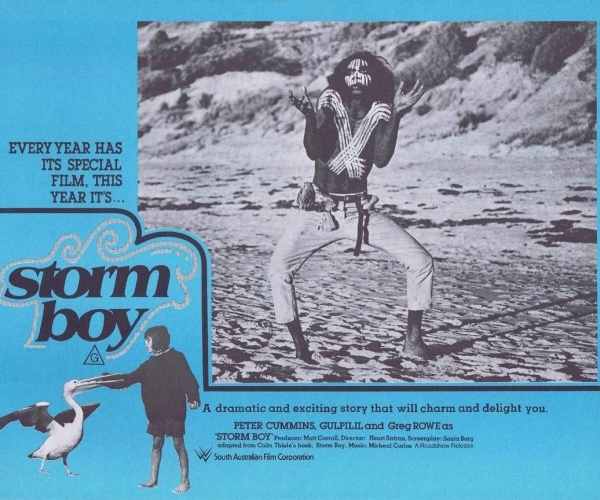 A marketing poster for the 1976 film Storm Boy. Storm Boy finds a sense of purpose in rearing three motherless pelican chicks, in particular Mr. Percival, who becomes his confidant. Through their steadfast relationship, lessons of loss and resilience pervade. These themes are visited in increasingly challenging encounters. The invasion of Hideaway Tom and Storm Boy’s beach haven by hoons makes us reflect on our own sense of security. As the dehumanised beach buggies tear up the dunes, destroying the undergrowth, we develop an awareness of environmental degradation as well as personal violation. Later in the story, we encounter the ominous spectre of the inebriated recreational shooters. This can only mean mayhem for the endangered birdlife in the wetlands of the Coorong. Our relationship with the natural world is challenged again when the lives of three anglers are threatened in a ferocious storm. In Thiele’s only fanciful moment of the story, Mr Percival rescues the sailors from their shipwreck. Perhaps the greatest challenge Storm Boy faces is that of growing up, and it is Hideaway Tom who must find the courage to let him. In a heartbreaking and all-too-familiar moment for any parent, Hideaway Tom sees the powerful curiosity and desperate need for community that pulls at his son, and cannot help but free him to follow it. The ache of loss as Storm Boy leaves the Coorong for boarding school is as inevitable as the love that allows it. 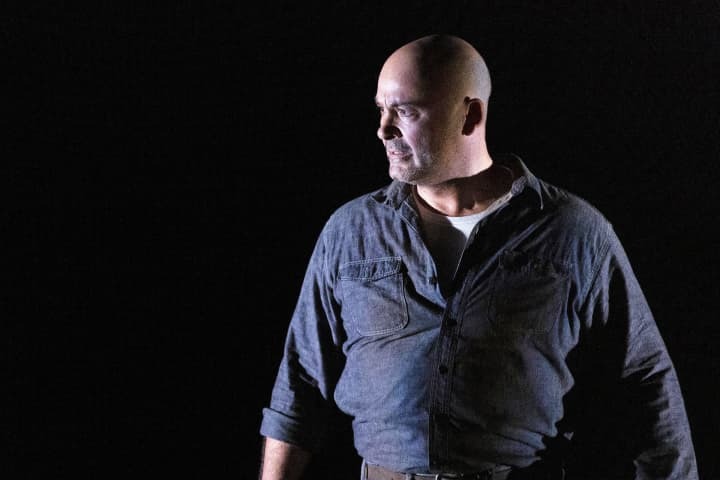 Storm Boy plays at Southbank Theatre, The Sumner from 17 June to 20 July, 2019.